Over the past 5 weeks I’ve taken part in an online PLD course run by Jane Hart of Centre for Learning and Performance Technologies. The course focused on Online Community Management. I took part in this course to help develop my understanding and skills for my role as Enabling e-Learning Facilitator within the Virtual Learning Network (VLN). I didn’t learn a huge amount from the course—a fair bit is common sense—but it was well put together with some good tips. I’ve also gone into a well-established community so some of it was not overly relevant to me at this stage. This is not to say it won’t be useful in the future. This post highlights the key takeaways for me from each of the 5 parts. Don’t set up a community just to have a community. A community must have a purpose and it must have a clear focus. The focus of a community might change over time as needs are met and new needs arise. The other thing that a community needs is a common interest. We don’t create that strong common interest. That interest must already exist. That interest must be strong. That interest must be common (shared by a number of people). People should be keen to discuss that interest in their spare time. We cannot force people into being interested in something that they’re not. While I’ve tried to consider ways to launch an online community before, I hadn’t realised how important the planning of this step is both in regards to when a community is launched and also how it is launched. We looked at 3 types of launches—soft, viral and official. With a soft launch the platform needs to be set up and a small number of (willing) users brought into the site to get things going. These users can get some discussions going, for example, but also can test functionality and make suggestions to improve the space before inviting others into the community space. A viral launch starts of in a similar way to the soft launch, but then viral marketing is used to grow the community. A strategy needs to be set up that encourages users to pass on the message about the community to others in order for it to grow. An official launch requires everything in the site to be set up, ready to go, and then announce the community site in an official way. This could be, for example, a face-to-face kickoff session or an email out to potential users. One person from Everest University Online organised a flash mob as their official launch! This was the week I was most looking forward to. How to maintain an online community. Within here, 50+ suggestions were given to help keep a community vibrant. It was interesting to read through these suggestions (from 3 different blog posts) and see how many the VLN community which I had recently been given the role of Facilitator in were already doing thanks to it’s current and previous facilitators! Member interviews – it could be both interesting and useful to read/watch an interview with various members. It gives an opportunity to make further connections and grow your PLN. Guest columnists/bloggers – although this can happen already, specifically inviting people (members or others) to write about a topic relevant to the community opens up opportunity for further discussions. This of course means that facilitators or community managers need to know their membership well and have a wide network to invite from. A study by Jakob Nielsen (2006) was considered in which he found that user participation tends to follow similar rules in different communities. The 90-9-1 rule is where 90% of the community are lurkers/listeners; 9% are intermittent contributors and 1% are heavy contributors. Flipping this around: 90% of postings come from 1% of users! Recent studies have shown that now it is closer to a 70-20-10 rule (and the terminology has changed slightly). 70% lurkers/listeners; 20% commenters; 10% creators. This type of ratio/rule could be looked at as a way to determine the success of a community. Decide on the ratio you want to aim for and measure according to this. Whether you call them a manager, facilitator, guide, mentor or other name, the community manager wears many hats. It reminds me a lot of online teachers (well, any teacher to some degree) who have to be teachers, parents (at times), social workers, counsellors, tech experts and more. 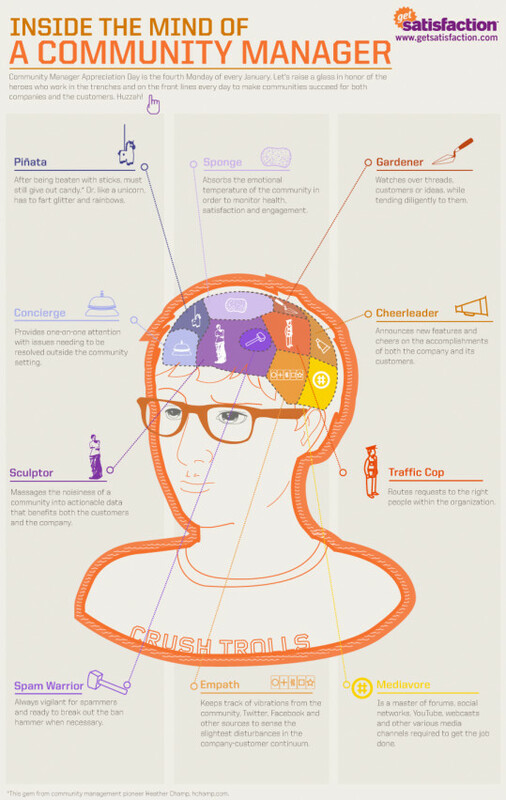 Rather than list all the roles of a community manager it’s easier to simply finish this post with this brilliant infographic that sums it all up.